Whatcha gonna do when the Bad Boys come for you? You'd better decide quickly, dear reader, as Will Smith and Martin Lawrence just confirmed that Bad Boys 3 is definitely, officially happening. Smith and Lawrence, who starred respectively as Miami detectives Mike Lowrey and Marcus Burnett in the 1995 action comedy Bad Boys and its 2003 sequel Bad Boys II, both took to their Instagram accounts to share videos and photos of themselves together on the beach in Santa Monica, California, where they celebrated the fact that Bad Boys 3 is a go. "Yo, yo, I'm telling y'all, I'm telling y'all, this is crazy. Just wait," Smith said, a beaming smile spreading across his face as Lawrence stepped into frame. "It's official, baby! Bad Boys 3 — it's happening! It's official!" The actor captioned the video, "It's been a LOOOONG time Coming. But now it's Here! @BadBoys For Life We back!! @martinlawrence." Smith later shared a still from the first Bad Boys movie, captioning it with a silly, "I promise you @martinlawrence won't have a beeper in the new @badboys #tbt." On his page, Lawrence posted a snap of himself standing next to Smith. He wrote in the caption, "It's official. Bad Boys for Life. #teammartymar #badboysforlife @willsmith #weback," before re-sharing Smith's video in a separate post. "Can't wait to hit the ground runnin! Blessed to be a part of such a great film with my brotha @willsmith. We still gotta learn the words to the song though!" Lawrence typed out, adding a "rolling on the floor" laughing emoji and the hashtags #teammartymar, #badboysforlife, and #weback. Smith is 100-percent correct in mentioning that it's taken years for Bad Boys 3 to come to fruition. 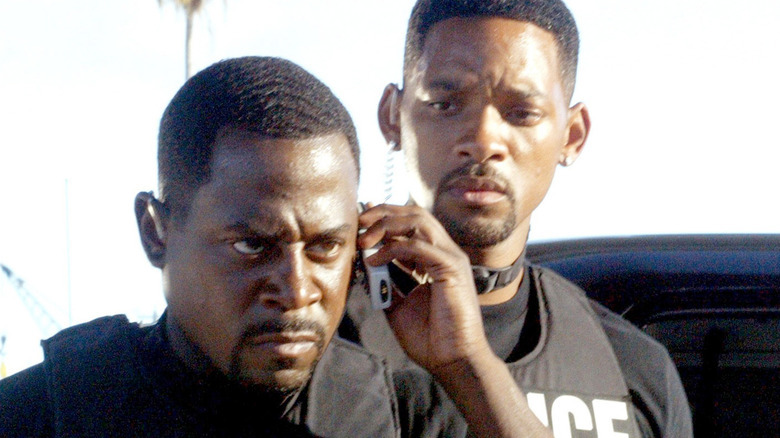 After spending over a decade years trapped in development hell, a third Bad Boys started to seem like a far-off dream that would never be realized, and fans began tallying up all the reasons why they might never get to see Smith and Lawrence back on the big screen as Mike and Marcus. Way back in March 2017, director Joe Carnahan (The A-Team, The Grey, Smokin' Aces) exited his Bad Boys 3 post, chalking his departure up to a mix of "scheduling conflicts" that "happen all the time" and his concurrent commitment to getting his and Frank Grillo's (Captain America: Civil War) production company WarParty off the ground. Five months later, Bad Boys 3 — also known as Bad Boys for Life, hence Smith and Lawrence's hashtags — faced another blow when Sony Pictures stripped the film of its planned November 9, 2018 release date and removed it from its release calendar entirely, not bothering to immediately reschedule it. Less than two weeks after that, Lawrence came forward and admitted that he doubted the film would ever get made. He told Entertainment Weekly, "I don't think we're going to get [another Bad Boys], not the way everything's turning out. Will is off doing another movie, and I don't think it's going to happen." Thankfully, the dark clouds parted and the sun began to shine on Bad Boys 3 in September 2017, when producer Jerry Bruckheimer revealed that Sony had selected a new writer to pen the film's script. At the beginning of this year, tides turned even further in the film's favor, as it was announced that Moroccan filmmakers Adil El Arbi and Bilall Fallah were in talks to direct and that Sony was planning to get the threequel behind cameras in August 2018. As of this writing, it's two months after that targeted production start date, so it seems that the film has now finally fallen into place. And with Smith and Lawrence affirming that the third flick is moving forward, it sounds as though everything's coming up Bad Boys. Bad Boys 3 is set to open (yes, Sony eventually put the film back on its film release schedule) on January 17, 2020.